Thinking Pinoy: FACT CHECK: Mocha Uson received P300K from BBM? FACT CHECK: Mocha Uson received P300K from BBM? Just when I thought I was done for the day with my newest article Mainstream Media's love affair with Leni Robredo, I was surprised to discover that various pages have been spreading an image that shows a cheque for Php 300,000, allegedly addressed to Mocha Uson and signed by no less than former Senator Ferdinand “Bongbong” Marcos. The photo has been shared by Liberal Party-aligned pages with Oras Na Roxas Na leading the pack. My initial reaction was shock, not for the allegation that Mocha received bribes from BBM, but for the fact it’s hard to believe that Mocha Uson could be bought for so little. A screenshot of the cheque is show below. 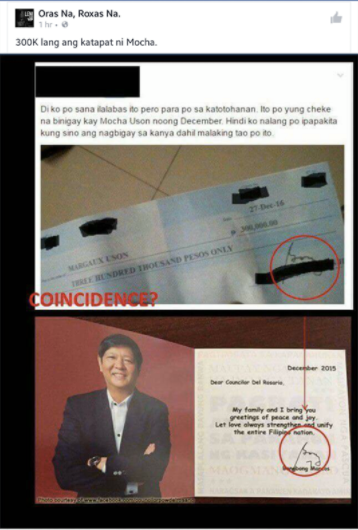 As we can see, the image shows the cheque amounting to Php 300,000, dated 27 December 2016, addressed to a certain “Margaux Uson”, and bears a signaure similar to the signature found on a 2005 holiday card sent by former Sen. Marcos. All other identifying marks in the check have been redacted, presumably the Silent No More, the original poster. The name, account number, and check number have been redacted, and I found that absurd. The check, if authentic, would be a direct violation of bank secrecy laws. If it were fake, then it would be a violation of existing libel and forgery laws. Regardless of its authenticity, Silent No More’s administrator has already committed a crime just by publishing the check, so why bother shading those three areas? Or maybe because it’s harder to photoshop those parts? For one, I could easily rip off a check from somebody else’ check book, blot the identifying arks, then forge the payee name, amount, and signature, then claim whatever. But that kind of reasoning is not sufficient to completely debunk Silent No More’s libelous claim, so here’s one more thing. All cheques have to go through the Philippine Clearing House Corporation (PCHC) for them to be completely processed. That is, cheques can be encashed only if they were prepared in accordance with PCHC guidelines. As we can see from the image above, the payee name written on the cheque “Margaux Uson”, despite Mocha having a pair of first names, i.e. Margaux is not Mocha’s complete first name. Note that the check is dated 27 December 2016. Yes, the payee's name, as seen on the cheque, is incomplete, so per PCHC guidelines, there’s virtually no way that check could have been encashed, as it was dated AFTER January 2016. Nice try, Oras Na Roxas Na, but your administrators lack the requisite neuron count to pull this kind of sh!t off. INCOMPLETE INFORMATION — This means that for a cheque to be processed by PCHC, all information necessary should be indicated. Your claim that the cheque is incomplete because "Margaux Uson" is not Mocha's complete name, I believe is incorrect. 1. PCHC only processes the clearing of the cheque. PCHC only handles cheques deposited to another bank different from that of drawer. Example: i deposited a BDO cheque issued to me to my BPI account. 2. It is not PCHC's responsibility to check whether the payee's name is different from the depositor's name. Example: Payee's Name: Margaux Uson, Depositor's Name: Thinking Pinoy. They do not have access to the details of the depositor. 3. That responsibility lies to the depositor's bank. Example, I am a bank manager of a BPI branch, our job is to make sure that the payee is the same person as the depositor. We have this "Know your Client" Policy. So if I believe that Margaux Uson is the same person as Margaux Joy Uson for instance, I can allow the deposit especially if it is within my approval limit. But the thing with this cheque is that it doesn't have any sign that it has gone through PCHC Clearing, or same bank clearing. It doesn't also have any sign that it has been encashed. In short, it hasnt been processed yet. Meaning, you're correct that anybody can get any cheque then claim anything most especially if the cheque details are redacted.